Add non-functional logic such as security, throttling etc. Build a more connected digital business by exposing, consuming and aggregating APIs via drag-and-drop. Web-based APIs are making it easier than ever to link services together – but being able to do this securely, scalably and reliably requires an end-to-end platform for exposing, aggregating and orchestrating APIs across legacy systems, cloud services and IoT-based resources. As businesses become increasingly digital, Web-based APIs are becoming a key enabler for connecting people, software and devices both inside and outside the enterprise. But building and managing APIs at scale is a huge challenge. Many organizations are still reliant on closed, monolithic systems that cannot support the scale and security demands of open Web-based architectures. Furthermore the common approach of adding non-functional capabilities via gateways or proxies only addresses a subset of the problem: true business value comes from aggregating, orchestrating and managing APIs to deliver end-to-end digital processes, something that traditional development and specialized API products are ill suited to address. Without completely addressing legacy integration, non-functional mediation and end-to-end process orchestration, however, enterprises cannot deliver the comprehensive API architecture necessary to succeed in the real digital economy. RunMyProcess makes it easy to model, deploy and operate APIs that wrap existing systems, implement business logic or orchestrate people, systems and devices in support of new API-driven applications and value chains. Our composite API builder allows you to quickly model, deploy and scale API endpoints and logic via drag-and-drop, enabling you to directly implement orchestration logic and add non-functional behaviors like security. Our out-of-the-box integration connectors make it easy to safely connect these new APIs to existing systems, extending them to new digital flows. Once deployed you can track the performance of your APIs via comprehensive reports. Use your API infrastructure to deliver value to people, taking APIs beyond the back-end and using them to build composite applications which integrate data from multiple services and deliver richer and more responsive experiences. RunMyProcess provides drag-and-drop tooling to quickly design and deploy composite applications that connect fields, lists and tables to underlying APIs, enriching them with data before delivering applications seamlessly to any device. RunMyProcess provides process management, composite APIs and an extensive library of integration connectors that make it easy to expose existing systems via APIs and orchestrate wider API-driven processes. By using drag-and-drop design tools RunMyProcess makes it easy to model, deploy and operate APIs that wrap existing systems, implement business logic or orchestrate people, systems and devices in support of new API-driven applications and value chains. The new connected environment is a highly dynamic and chaotic place, with changing customer demands, new competitors and the need to connect a wide variety of in-house and 3rd party resources. RunMyProcess tames this complexity by offering powerful drag-and-drop editors, full lifecycle support and comprehensive reporting - abstracting detail and automating technology to visualize, deliver and evolve API-driven systems at a different speed and scale. RunMyProcess offers an additional prototyping environment that makes it easy for IT and business users to test new composite application ideas before taking them into full development. By making it easy for business users to set up and test the forms and processes they need - with or without IT support - it enables them to understand the required user experience before asking IT colleagues to connect the application with the necessary underlying APIs. 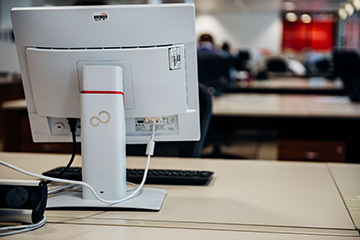 See how Fujitsu connected heterogeneous service desk systems from around the world to provide a truly global service.